Lung Cancer is most commonly associated with smoking cigarettes, however, it can be caused by inhaling asbestos dust. People exposed to asbestos inhale hundreds and thousands of asbestos fibres, which may cause asbestos lung cancer. Asbestos exposure and smoking act together to produce an increased risk of lung cancer in people exposed to both hazards. Fortunately, this means that people who have been exposed to asbestos can greatly reduce the risk of lung cancer by not smoking. The main types of lung cancer are small cell lung carcinoma and non-small cell lung carcinoma. This distinction is important because the treatment varies; non-small cell lung carcinoma (NSCLC) is sometimes treated with surgery, while small cell lung carcinoma (SCLC) usually responds better to chemotherapy and radiation. Non small cell lung cancer accounts for almost 80% of lung cancers. Small cell lung cancer accounts for about 20% of all lung cancers. Most instances of Asbestos Lung Cancer starts in the lining of the bronchi, the tubes into which the trachea or windpipe divides. However, this type of cancer can also begin in other areas such as the trachea, bronchioles, or alveoli. Asbestos lung cancer usually develops slowly, once it occurs, cancer cells can break away and spread to other parts of the body. People working in industries such as plumbing, demolition work and at power stations, are likely to have been exposed to breathing in fibres of asbestos often over a period of years. Asbestos related lung cancer can take several years or more to develop, so ill effects are not instantly traceable to asbestos. 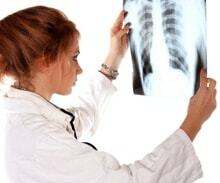 Some of the symptoms of asbestos induced lung cancer are . . .
Persistant cough caused by irritation of the tubes that carry air in and out of your lungs. Breathlessness - if the tumour is either large or blocks off an airway. Wheezing from that side of the chest, this may make it difficult to sleep on one side. Pain - usually only if the tumour reaches the edge of the lung. 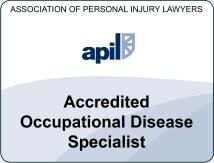 If you have been diagnosed with asbestos induced lung cancer in the last 3 years you will be able to make a claim. Doctors will accept that lung cancer has been caused by asbestos exposure if it can be shown that the person suffering from lung cancer already has asbestosis or has been exposed to enough asbestos dust to cause Asbestosis. The success of the claim will depend on whether the company where the exposure occurred is still in existence. If you are not sure, don't worry; it could be that the company was taken over, or that the insurers of the company still exist. In either case we will find out on your behalf as part of the service.